Jan. 26, 2013 - PRLog -- Strategic and Innovative Planning along and its structured implementation with commitments and dedication always work in real-estate industry. Recently launched Ultra Luxury Commercial Project, Premia Corporate City at Knowledge Park, Greater Noida (West) sets the best example to this. 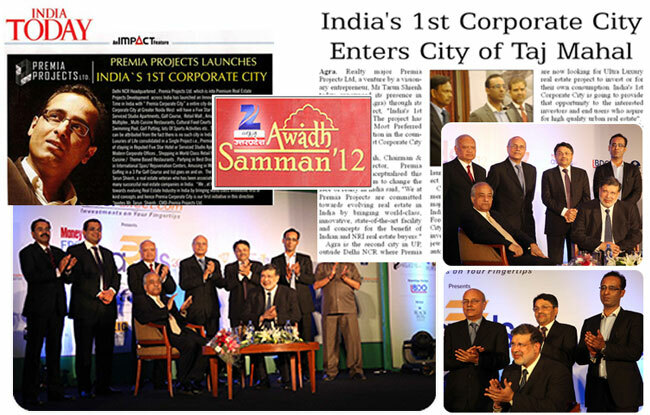 For its acclaimed and appreciated project, “Premia Corporate City” announced in 2012, Organization not only received positive and strong market response but also received awards by Builders Council of India for its Best Location Selection in the City. Premia Projects Ltd initially announced India’s First Corporate City with 5 Star Hotel, Corporate Offices, Serviced Studios, Golf Course, Retail Mall, Amusement Park, Banquet Hall, Multiplex, Food Court, Restaurant, Banks & ATM Space with other modern services and amenities which a Corporate House will not miss in this Corporate City. Combination of American Style Duplex Villas gives the Corporate City new dimensions of luxurious living. Combination of “Yamuna Expressway”, connecting Greater Noida with Agra and Proposed “Metro Route”, connecting it with Delhi-NCR will be going to make Greater Noida another Corporate and Business Hub in coming years. After the launch of Yamuna Expressway, lot of Residential Township projects, Corporate Parks and Business Park projects were announced in Greater Noida and Noida extension to capture the mileage, but Premia Corporate City stands ahead of any competition due to its combination of promising location selection, investment advantage and innovative distinct project plan. “Yamuna Expressway actually brought Agra far more closer to Greater Noida with convenient and easy travel, therefore Premia Projects opens the Concept of Corporate City in Agra for the Investors to explore and invest in our unmatched masterpiece project”, quoted Mr. Tarun Shienh, Managing Director, Premia Projects Limited during his Agra visit where he introduced Premia Corporate City open for Investors looking for Capital Appreciation and Rental Income at India’s upcoming most promising commercial real estate project. Premia Projects Limited in past few months expanded its operations in different states with its Regional Offices at Lucknow followed by Patna and Agra. The Company is planning to go PAN India so that investors can actually explore out this opportunity and can think beyond just Business Park or Corporate Park and can move to India’s First Corporate City. The Concept will actually be ideal for Corporate Houses, International Brands or Companies with their Offices in India, Retail Brands and NRI Investors. Developing World Class Infrastructure at Greater Noida combined with innovative concept and implementation of masterpiece project with commitment and vision, is a combination which actually makes “Premia Corporate City” an unmatched project.